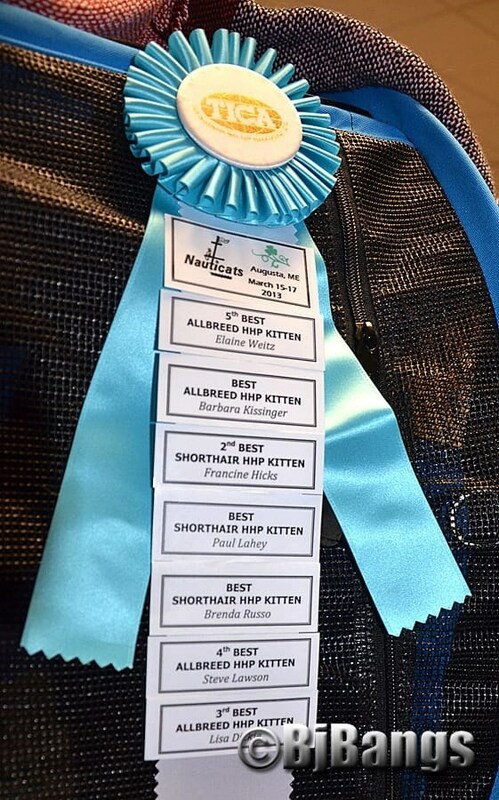 A feral kitten winning tons of awards at the NauTICAt’s TICA (The International Cat Association’s) annual show in Augusta, Maine is quite a feat, and one of which she and those showing her should be very proud. 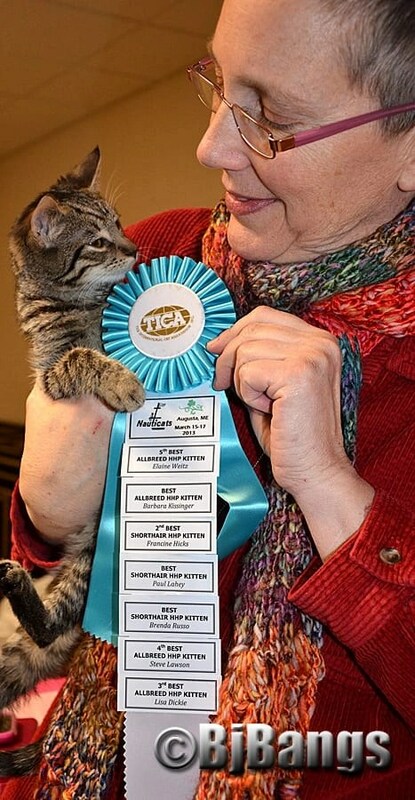 The kitty angels from Maine’s Forgotten Felines entered six-month-old Dandy Little Lion into the kitten competitions, and she walked away with tons of ribbons and a new forever home. Dandy Little Lion is a very special kitten and like all kittens, a real cutie. Kittens, whether from a traditional shelter or with rescue groups like Forgotten Felines, are quick to be adopted. That is because there’s nothing more adorable than a kitten or puppy. The little ones move fast. That’s not so for mommy and the older cats. It takes much longer for them to be adopted out. This little kitty was part of Forgotten Felines of Maine’s adoption event at the Augusta NauTICAts show, the largest cat show in Maine. According to Pam Hansberry, of Stockton Springs, they had no intention of entering Dandy Little Lion into competition. She was there as part of an adoption event, one of many the shoe-string feral cat rescue operation does throughout the year. But Dandy Little Lion proved that ferals are just as cute as any other cat. She didn’t enter as a purebred because she wasn’t one. She is just a very sweet kitten. Ferals are different in domestic cats in that they have become afraid of humans. They have been dumped off as dumpsters, fields, forests, and in their neighborhoods to fend for themselves. Their humans turned them out for any number of reasons: money, family issues, moving, or just too many cats. They are left to fend for themselves. With time, they revert to their natural instincts and become wilder. As time progresses, and generations continue, they revert to becoming wild animals. Kittens, however, have not adopted all these fearful behaviors, and if socialized young, they can adapt and be very loving, great household pets. Some older cats are considered semi-feral – they are less afraid of humans, but are timid and scared of them. Others have become so scared; they revert to living in groups of other cats. These are called colonies. Thanks to Forgotten Felines of Maine, Dandy Little Lion found a new home. Other cats they brought to the TICA show did also. This is only the tip of the iceberg for Forgotten Felines. They do tabling events from Augusta to Bangor. They put on bake sales. They sell items. Paws bought a beautiful cat shaped bird bath and planter holder from Forgotten Felines, asking if the money would go to them. They said yes. The items had all been donated. With that, Paws’ mom quickly made her purchase to help this great organization. In 1989, Pam Hansberry, the founder of Forgotten Felines, noticed stray cats in the massive complex where she was living in Philadelphia, PA. Like many caring individuals, she started feeding them. She then learned about Alley Cat Allies is the only national feral cats’ organization dedicated to the Trap, Neuter, Return (TNR) program, where they are trapped, neutered and then returned to their cat colony or outside home. It was there that Hansberry learned to trap, spay and neuter and releasing back to the wild. TNR is all about trapping feral cats, having them spayed/neutered, and then returning them to their colony to live out their days. The TNR program curbs the ability to reproduce – something cats are quite prolific at – and stops the unwanted cat calling and fighting associated with mating. The spay/neutered cats have an ear tipped so one can tell who has been fixed, and what cats need to be trapped. It takes time, but Alley Cat Allies is convinced the program works. It reduces undesirable cat behaviors and with time, the number of cats in the colony is reduced. 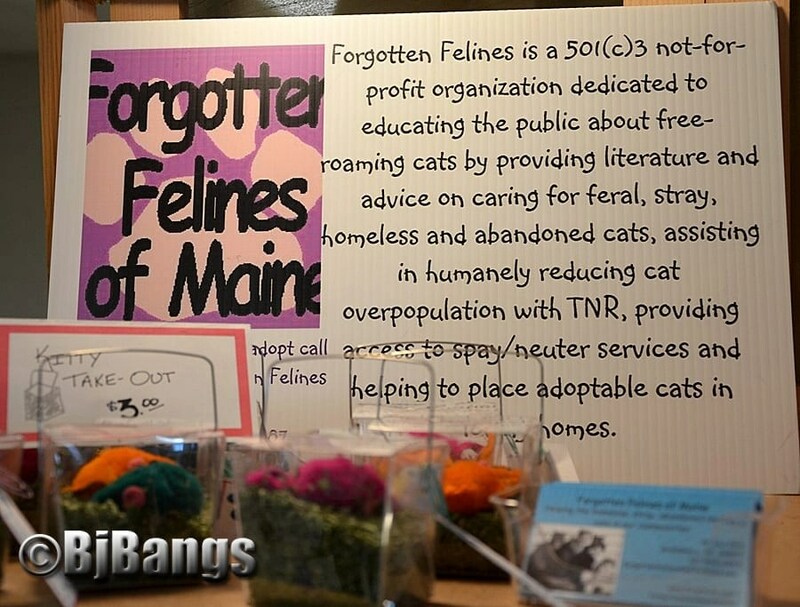 According to Forgotten Felines of Maine’s website, the organization was started in January 2009 and received nonprofit status in February 2010. They are dedicated to educating the public about feral cats by providing literature and advice on caring for feral, stray, homeless and abandoned cats, assisting in humanely reducing cat overpopulation with TNR, providing access to low-cost spay-neuter services and helping to place adoptable cats in loving homes. 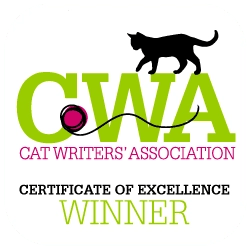 Forgotten Felines works to raise awareness of the plight of the feral cat by promoting and expanding humane methods for the care of these cats. The owner of Maine-ly Cats, a business that makes cat products and other board members joined forces to create Forgotten Felines. 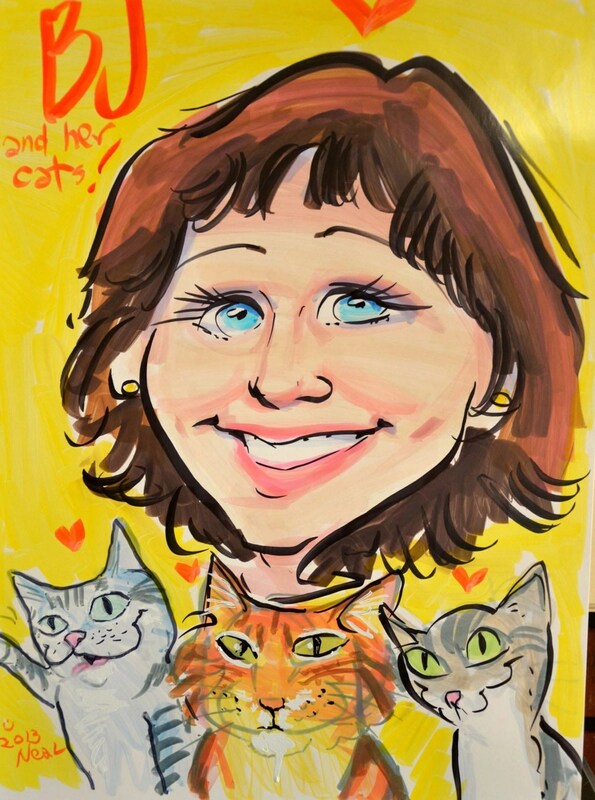 Over the 20 years she has been working with feral cats, Hansberry said she has rescued more than 1,000 felines. Last year, Forgotten Felines took care of 313 feral cats in Maine. The organization, dedicated to helping feral cats, receives no federal or state funds. They are 100 donor based. They have two large sales a year, one at Marden’s in Brewer, and their annual yard sale. They also host a number of tabling events throughout Eastern Maine all year long. That gets the cats in front of the public, and many like Dandy Little Lion are adopted. Forgotten Felines is one of two major feral organizations in Maine. The other is Friends of Feral Felines in Southern Maine. People can make donations by visiting their website at forgottenfelinesme.org, sending a donation to Forgotten Felines, PO. Box 264, Gouldsboro, ME 04607. They also have a Facebook page. What an awesome statement for feral kittens! 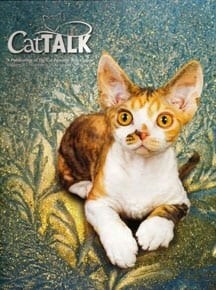 Do you have stories to share about ferals participating in the non specific breed competition at cat shows? If so, please share. That sure is an inspirational story!! Glad Danny Little Lion found a forever home! 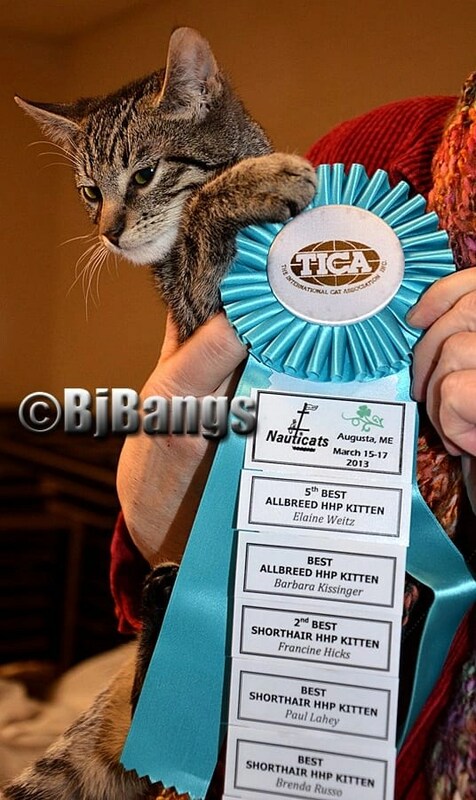 Yes, it was awesome to see a little feral kitten get recognition. The feral kittens can make wonderful pets. I can attest to that since my little Lenny was born feral, rescued at one week old, bottle fed, and now is an absolutely super special kitty. Great job on the article….love your description of a feral cat….thank you. Dandy is a little girl. Our mailing address is Po Box 264, Gouldsboro, ME 04607 (our Bangor PO box has been inactive for well over a year so forwarding will not happen). Made the address update, and keep up the great work. (The PO box in Bangor was closed over a year ago so no forwarding of mail will be done. How pawsome that a feral kitten overcame the odds and became a champion! Yay to him and his humans! Purrrrrrrrrrrrrrs.